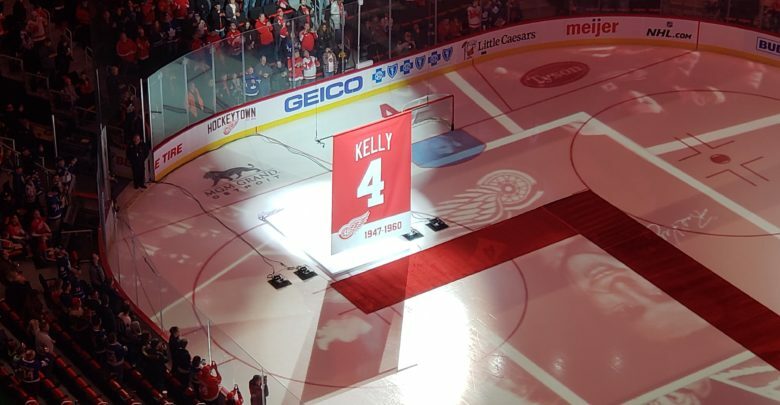 After an incredible Hall-of-Fame career that saw legendary defenseman/center Red Kelly win eight Stanley Cups, four with Detroit and four with Toronto, his name and number were finally retired to the rafters. It was a 52 year wait for Red, who was on hand for the ceremony at the age of 91. Kelly was on the 1967 Leafs team that won the most recent Stanley Cup. He was also on the 1955 Red Wings team that won the Cup. It took Detroit 42 years to win another. It would appear that Kelly was very valuable to those great teams. Maple Leafs fans packed the stands for the occasion and far outnumbered the amount of Wings fans in attendance. There were numerous chants of Go Leafs Go which were not countered by chants from Detroit. The first period was scoreless as it took Toronto 13:40 to register their first shot on goal. The second was much more evenly matched. Gustav Nyquist broke the scoreless tie near the midway mark of the game as Athanasiou passed the puck across the crease for an easy goal. Before the period concluded, Auston Matthews scored on a hard wrist shot following a pass by Patrick Marleau. In the third it appeared that Detroit’s Thomas Vanek may have scored, as a power play rush to the net saw the puck gloved by Frederick Andersen right near the goal line. Replays were conclusive that it didn’t cross the line, though it was close. 18 seconds later, Detroit scored, and again the same official motioned no-goal at first, before replays showed the Dylan Larkin snap shot went off the shoulder of Andersen and the top left corner of the net. It was a fantastic pass by Vanek to set up the goal on the power play. Coach Blashill was impressed by the special teams play tonight. Late in the period, Patrick Marleau scored to force overtime. The puck shot by Matthews deflected past Jimmy Howard off the glove of the veteran forward. It was not challenged. In the 3-on-3 OT that followed, Danny DeKeyser was the unlikely hero that potted a shot from a great set up by Nyquist. In overtime, Larkin fell to the ice in pain, although it doesn’t appear that an opposing player injured him. It looked like some variety of muscle strain. He would leave the game. Blashill said he hopes he will be able to play tomorrow, saying there’s a chance, which is good news for the young forward, as it clearly not a major issue.